When Exiting Highway 401, take the exit at Leslie St and head North. Then turn left at Sheppard Ave and head West. Turn Right at Ambrose Rd and then turn right onto Eunice Rd. 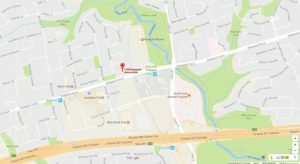 Parking is available in the front and rear of 1100 Sheppard Ave E. and 1110 Sheppard Ave E.
If no parking is available in either lot, parking is available on the north side of Ambrose Rd. Click on the map for full directions.